Uwingu's video previews a venture aimed at engaging the public and raising money for space researchers and educators. Will you Uwingu? A commercial venture that's been founded to fund space research and education is betting that you will, even if you're not a hard-core space fan. But what is Uwingu? The founders are being coy about that, in order to build interest for their Indiegogo crowdfunding campaign. As of today, they're almost a third of the way toward their goal of $75,000 in seed money, with 30 days left to go. Just today, Moon Express became the venture's first corporate sponsor, and XCOR Aerospace quickly followed up with the second $1,000 sponsorship. One of Uwingu's founders, planetary scientist Alan Stern, talked about Uwingu tonight during "Virtually Speaking Science," a program that's presented on the Web and in the Second Life virtual world. If you didn't hear the show in real time, don't worry: The hourlong program is being archived at BlogTalkRadio's website as well as on iTunes. It's hard to think of a space issue that the 54-year-old Stern hasn't been part of during his decades-long career. He's a space scientist at the Southwest Research Institute in Boulder, Colo., principal investigator for NASA's New Horizons mission to Pluto and the Kuiper Belt, a one-time astronaut trainee and a champion of suborbital space research. For a time, he served as NASA's associate administrator for space science — and sometime in the next couple of years, he's likely to get to outer space himself, on a rocket plane built by Virgin Galactic or XCOR Aerospace. 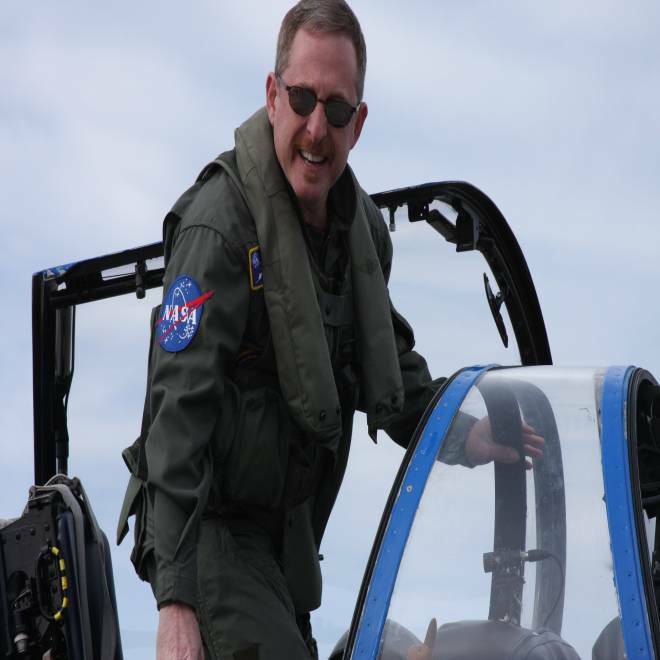 Planetary scientist Alan Stern has been in training for a suborbital research flight. Right now, Uwingu is the project Stern is most anxious to talk about. The name comes from the Swahili word for "sky," and the venture's backers hope that Uwingu will eventually make things easier for researchers and educators who focus on what's going on in the sky above. In addition to Stern, the venture's backers include space historian Andrew Chaikin, educator Emily CoBabe-Ammann, citizen-science leader Pamela Gay, science museum curator David Grinspoon, planet hunter Geoff Marcy, and planetary scientists Teresa Segura and Mark Sykes. "Uwingu will employ novel software applications to 'game-ify' space, with the profits going toward research and education," Gay said in a news release issued this month. "Our projects will be fun to use, and the proceeds from their use will make a real difference in how space exploration, research and education is funded." Stern says a million dollars' worth of software development effort has gone into the venture already, and the $75,000 will help pay the bills for future development. He's not willing to be specific about what the software will do, but he thinks it'll be engaging enough to draw in people who wouldn't otherwise care about space science. The revenue could amount to millions of dollars, with half of that being offered to researchers and educators through a peer-reviewed grant program, he told me. Even though Stern is keeping mum, there's a clue to his secret in the trademark database entry for Uwingu: The trademark refers to "a website featuring online technology that enables users to name both features on the surfaces of bodies in the solar system and solar system bodies themselves." If I had to guess, I'd speculate that Stern and his colleagues might be banking on future discoveries on the solar system's rim. Those naming opportunities might be made available to Uwingu's users as part of an online treasure hunt. But that's just a guess — and I'm a notoriously bad guesser. Cosmic Log: How did Uwingu get started? Alan Stern: "I had the idea for this several years ago, but I didn’t really execute on it until the beginning of 2010. We got a team together and formed a company, and we started writing software for the first app. Now, you’re probably wondering, 'Why did it take two and a half years?' The first thing we wanted to do was a project that was so massive in scope that we needed to raise a couple of million dollars in venture capital to put together the software product. "Ultimately, we decided we didn’t want to give away a lot of ownership, because our central goal was to create the Uwingu Fund for space science and education. We just didn’t want to cede that to someone with a big checkbook who might say, 'Well, I don’t like the idea of giving away 50 percent. I want that 50 percent, and I own the company.' Although we developed a great idea, it just wasn’t feasible to finish it. So we developed the second product, beginning about this time last year. That was much easier, and that’s actually what we’re going to roll out with. We had a bit of a false start, although the work’s not wasted: We intend to take the half-developed initial project and make that our second product. To finish it, we’ll use revenues coming in from the first project." A: "Not at all. Let me tell you what Uwingu’s about: We’re turning the old paradigm upside down. Typically, people create nonprofits, and they say, 'This nonprofit supports a certain cause' — in this case, space research and education. Sign up, be a member, contribute. That’s how the American Heart Association works on heart disease." A: "Right, I’m a member of the Planetary Society. I’m a huge fan of theirs. Nothing wrong with the Planetary Society. But we don’t want to create a competitor for the Planetary Society, or the National Space Society or the AIAA or anybody else. And if you look at those groups, they have a very narrow 'wheel base.' That’s not unusual. It’s just reflective of the fact that not that many people really care about space enough to join groups and contribute. "So we asked ourselves, 'How can we have a large impact?' We know that space researchers and educators currently have only one major funding source: NASA. If you’re a medical researcher, and the National Institutes of Health has its budget cut, you’re not totally out of luck. You can go to the Howard Hughes Medical Institute, or the Gates Foundation, or a hundred other places where you can find funding. If you’re a geologist, and USGS gets cut, you would probably go work for a gas company, or a mineral resources company. If you’re in math, or computer science, or in atmospheric science, you’ve got a full range of options. "The point is, space funding is not diversified. NASA is pretty much the one-stop shop. Your fate depends not just on how well you do, but also on how well NASA fares. And NASA has been suffering the vicissitudes of a tug of war between Congress and the administration. Every year we hear that 'this is not a good year to have an increase.' The economy is bad, the election is coming up, it’s the wrong topic, there’s something else pressing, we just had 9/11, we’re in a war. It’s always something. We want to create a second way for space scientists and educators — in part to give them a backstop in bad times, when there are budget cuts, but also to create more capacity to get things done. "The analogy I like is to think of NASA as a highway. We’re trying to add an extra lane to the highway. When there’s a budget cut — a traffic jam — you have the option of getting in a new lane and moving forward. And when everything’s going fine, the extra lane adds capacity. We’re not just looking to help in bad times, we want to help in good times, too. "You might say, 'Look, NASA’s got an $18 billion budget — how much more money can you generate?' Well, we don’t need to generate that kind of money. The actual amount of money going to the researchers in space science is only a couple percent of the NASA budget. It’s a few hundred million dollars — it’s not billions. As you know, people scream when there’s a cut to that budget. If we could generate 10 percent, or 5 percent, of the research money, then we could really have a positive impact. "So here’s what we came up with: Instead of putting our tin cup out for a good cause, and getting support from people who are interested in the cause, why don’t we turn the business model upside down? Why don’t we just create products that people want to engage with and buy, and we’ll take everything that’s left after we pay our bills and put into the Uwingu Fund. Because we’re selling products that people who are not space fanatics will purchase, all of a sudden your addressable market becomes the world. Not just the space world, but the world. "These particular products — which I’m not going to tell you about — will be of interest to schoolkids and educators, to hobbyists, to all kinds of people from all different walks of life, most of whom won’t say 'space is on the top of my list.' We’re going to see people all over the world engaging with this. The biggest space societies in the world have about 100,000 members. We expect to have millions, and possibly many more, engaging with Uwingu products every year. We think we’ve got a concept that breaks the mold for how you support space activities, but it’s a little indirect. "So here’s the way it works: If our IndieGogo crowdsourcing campaign is successful, and we have enough money to launch the company, we’ll debut the website. We’ll have a party. People will come to the website and spend their money. We’ll pay our bills, and we’ll put what’s left in the Uwingu Fund. Our target is to put half the revenue into the fund, and pay our bills from the other half. The fund starts to build up, so we’ll have tens of thousands, hundreds of thousands, millions of dollars in the fund. Then we’ll do calls for proposals. We will announce to the research and education community that proposals for funding will be due on a certain date. Then we’ll have review panels select the best, and we’ll fund them. And every few months, we’ll do this again, and again, and again. "We’ll disburse money as a 'fifth lane' in the highway. From the researchers’ point of view, it looks just like another grant program. We can be their salvation in tough times, and their accelerator in good times." Q: It sounds as if this would be some sort of mobile-device app, or Facebook game. A: "This is all about suspense, Alan. Look, it’s no worse than Dean Kamen with the Segway. Before the secret was revealed, he wouldn’t tell you what it was, and he wouldn’t tell you what it’s not. If we tell people now, when it’s announced, they’ll say it's old news." Q: All right, fair enough. Now, when you’re talking about support for research, it sounds as if you’re not getting a spacecraft going, but that the things you'll be funding are more in line with doing research studies. A: "We envision supporting graduate students, and researchers, and educators — not just public outreach types, but also high school teachers, science departments in grammar school, the whole spectrum. We don't imagine being able to fund entire space expeditions, but we might be able to enhance missions. Maybe it's an instrument on a Google Lunar X Prize mission, or on a suborbital space mission. Or we might be able to help somebody build a prototype so they can propose an instrument for a NASA mission. If we’re so successful that we can generate something on the order of a billion dollars a year for the Uwingu Fund, then obviously we’ll get into the mission game. But our goal is to have a grant fund that has millions or tens of millions of dollars each year. We think that's a very high goal. Anything can be proposed, and we’ll pick and choose based on what we can afford and where we can make the biggest impact." Q: You’ve been on the other side of the desk, as an associate administrator at NASA. How do you think NASA might feel about Uwingu? A: "We've spoken to a few high-level people at NASA about it, and their perspective on doing this is 'absolutely.' We’re not competing with NASA, we’re adding extra capacity. I’ve heard nothing negative. I can tell you that if I was there and somebody came up with this idea, I’d say 'Thank God,' because it means when we have a cost overrun and we have to make a cut in some project, people have somewhere to turn." Q: I had a few questions on the other projects you’re working on – for example, the Pluto stamp campaign? A: "The campaign is over, and now the ball is in our court to turn in the proposal to the Post Office. I expect that proposal will be turned in before August is complete. Then we don’t expect to hear anything until 2015. We just have to sit and wait." Q: And New Horizons? What’s the next step for the Pluto mission? A: "The spacecraft is very healthy. The team is extremely busy building both the main-encounter sequence and the backup, the bailout trajectory. We’re also hunting for more moons and looking for Kuiper Belt objects to fly by after Pluto. We are so busy as a team that people are working nights and weekends to be ready for 2015. The spacecraft is in hibernation right now. We’ll be waking it up on Jan. 6 for about a month. While we’re in hibernation, we take cruise science data on the interplanetary medium. We talk to it once a week, on Monday mornings, to make sure everything is fine. And that’s about it." Q: How are things going on the preparations for suborbital spaceflights for researchers? A: "We’re making plans for the next meeting for researchers in the Boulder area next June. We had 200 people the first time, and we doubled it to over 400 this year. Things are heating up." Q: Now that the $2.5 billion Mars Curiosity mission is under way, people are talking about the cost of planetary science missions, and what the prospects are for future Mars missions. What do you think is the right thing to do? A: "Well, people are very worried about sequestration and making things worse, but the right thing to do is a combination of more funding and better cost control. We’d get a lot more done with that one-two punch. Realistically, I don’t think there’s any realistic scenario where NASA grows dramatically. But I do think that private space efforts are going to give us a lot of new options. You’re starting to see the focus move from just launch vehicles and capsules to science areas — like suborbital, like what Planetary Resources is doing. I think you’ll see more things like that. I’ve heard of some things that are in the works that are just amazing. And so I’m very optimistic that commercial space is going to give us a much broader space economy. "You know, the military isn’t the only purchaser of airplanes. There are also cargo lines and airlines, agricultural uses, even tourists. Hopefully, space efforts in the 21st century will grow in the same way to become a very diverse set of markets — including in the science world." You can tune in "Virtually Speaking Science" on BlogTalkRadio or in Second Life at 9 p.m. ET (6 p.m. PT/SLT) on Wednesdays. Tonight's show is being archived on BlogTalkRadio as well as iTunes. Last updated 10:15 p.m. ET.